Prairie dropseed, Sporobolus heterolepis, in mid-summer. Prairie dropseed, Sporobolus heterolepis, is a warm season grass native to the tallgrass and mixed grass prairies of central North America that is also a popular low-maintenance ornamental landscape plant in zones 3 to 9. Found mainly on the Great Plains from Texas north to southern Saskatchewan, this long-lived perennial clump-forming grass also occurs less commonly in certain habitats in scattered pockets in the eastern Midwest and Northeast to Quebec. It is native to about the southern half of Wisconsin. It was was named a Plant of Merit by the Missouri Botanical Garden in 2005 and was selected as the Wisconsin Nursery and Landscape Association’s herbaceous perennial of the year 2018. Prairie dropseed in late May at Olbrich Botanical Gardens, Madison, WI. Plants grow 2-3 feet tall and wide from a fibrous root mass, forming an arching, fountain-like mound of foliage with a fine texture. The smooth, medium green linear leaves are very narrow and either flat or rolled. In fall the dense tufts of foliage turn an attractive golden bronze, often with orange or copper highlights, and resists flattening by snow so this plant can provide winter interest if not cut back until spring. 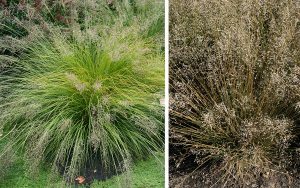 Prairie dropseed flowering (L) and in seed (R). In mid- to late summer small pink and brown-tinted flowers are produced in airy, 3-8 inch long flower heads with a narrowly pyramidal silhouette. One or more stout but slender culms develop from the center of each leafy clump. The wiry, open branching panicles terminating in individual spikelets are held well above the foliage and add movement in the garden. Each spikelet has two glumes of different lengths, a lemma, a membranous palea and a floret. The wind-pollinated florets are highly unusual for a grass, having a fragrance variously described as vaguely reminiscent of coriander, licorice, popcorn or sunflower seeds. 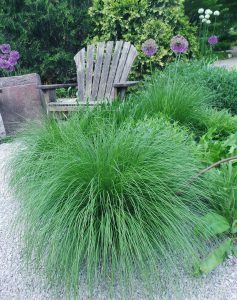 The florets are followed by small, smooth, hardened rounded seeds (technically an achene, a type of fruit, rather than the more normal caryopsis or grain that most grasses produce) within tan hulls, which drop to the ground when mature – hence the common name of dropseed. Birds such as sparrows and juncos, and other animals, feed on the seeds; Native Americans ground the seed to make flour. Although it does produce seed it generally does not self-sow freely in gardens. New growth of prairie dropseed in spring. 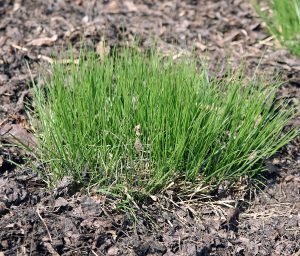 Grow prairie dropseed in full sun in most types of well-drained soil. Although it prefers dry, rocky soils it does fine in heavy clay, too. It tolerates drought, but also periodic inundation so can be used on the upper edges of rain gardens where it doesn’t remain too wet. It has no serious pest problems, is not favored by deer (although it may be grazed), and is tolerant of juglone so it can thrive around black walnuts. 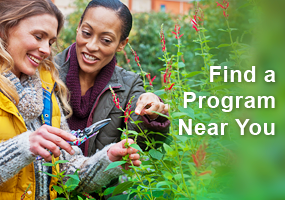 Once established it needs little care other than pulling, cutting, or burning the old foliage off in late winter or early spring before new growth begins. Prairie dropseed combined with fall-blooming sedums and alliums. 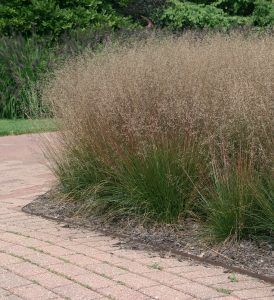 Use prairie dropseed in perennial or mixed borders, naturalistic plantings, meadows, and restored prairies and roadside revegetation. It is a good addition to rain gardens and aids in erosion control. Its fine, flowing appearance is a good contrast to plants with bold foliage or upright form. It makes a great filler between many types of herbaceous perennials, but especially those native to prairies, too, such as purple coneflower (Echinacea purpurea), small goldenrods, liatris, blackeyed Susan (Rudbeckia fulgida var. fulgida), and butterfly weed (Asclepias tuberosa). Planted in large masses it can be used as a tall ground cover or can be used to create a distinctive border, but it can also be used as an accent specimen plant. It is particularly nice when positioned so the flower and seed heads are backlit. Prairie dropseed with purple Verbena bonariensis and other ornamental plants. It can be the dominant plant in a “matrix planting” where a single species, or handful of species form a matrix into which other plants are blended. In its native habitats it is commonly associated with little bluestem (Schizachyrium scoparium), big bluestem (Andropogon gerardii var. gerardii), grama grasses (Bouteloua spp. ), panic grass (Panicum spp. ), Indiangrass (Sorghastrum nutans), leadplant (Amorpha canescens), green milkweed (Asclepias viridiflora), coreopsis (Coreopsis spp. ), purple sorrel (Oxalis violacea), phlox (Phlox spp. ), and yellow cone flower (Ratibida pinnata) among other plants. Sporobolis heterolepis ‘Tara’ at Olbrich Botanical Gardens, Madison, WI. 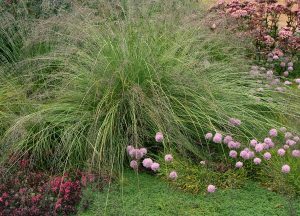 Although prairie dropseed can be grown from seed, it is slow growing, taking about 4 years to reach blooming size so is often started from plugs (in prairie restoration) or divisions (in gardens). 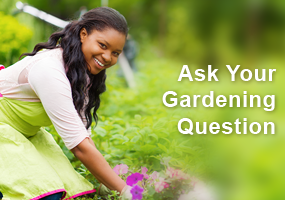 If growing from seed, sow outdoors in fall or stratify in dry soil for 10 weeks if planting indoors in spring. Divisions, taken in spring once growth resumes, can take a long time to establish, but clumps rarely require dividing and are very dense and difficult to divide. Generally only the species is available, however, plantsman Roy Diblik of Northwind Perennial Farms in Burlington, WI discovered a dwarf selection in 1994 in the Kettle Moraine area and introduced it as the cultivar ‘Tara’. Was looking for a grass that would fill a void spot on and embankment which leads to a creek.to prevent erosion. Noticed on responder had a struggle with growing it on a slope as I wish to do. Sounds like it would also stop erosion on the slope. Would need quite a few plants so am thinking about starting from seed as Ron discussed in another comment. Like the idea of growing native plants which I have many. Very low maintenance even in last summers challenging heat an drought. Didn’t lose any plants. Growing prairie dropseed from seed indoors has a few “secrets” you need to know. Unlike most native grass seed, this one does want a cold (slightly moist) stratifacation, not a long one but 30 days will do it. Most important, it needs scarifacation before going into cold treatment. To do that, place seeds in a plastic bag with sand and massage the seed/sand mixture between your thumb and fingers. This action helps peel off the outer husk from the seed. After scarifacation and stratifacation plant your seed/sand mixture in 2″ starter pots with mixture on top of moist starter soil. Make sure to compact seeds down for good soil contact. I plant so that there are about 25 to 30 (just guessing) seeds put into each pot. Cover pots with plastic see-through covering and place pots on a plant heating pad in south facing window. Your seeds should be up within 7 to 10 days. Use grow lights if you don’t have enough natural sun light. After about 2 to 3 weeds, I’ll divide the plants into 2″ pots and breaking clumps of 4, 5, or 6 little plants. I’ve seen people divide into individual single plants, but die-off is high that way. By this time, if spring weather is warm enough, I’ll carry transplants after a week or two outside for sun exposure. Keep out of the wind and too much sun. If you have a cold frame, that is the best way. 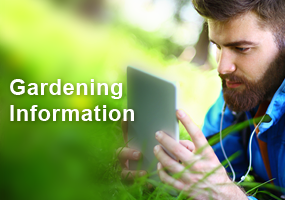 Bring the plants in later in the day as spring temperatures still are too cold at night. After a few weeks from this point, you are ready for transplant to their placement outside location in well worked up soil. You do have to water the plants for several weeks. With this method of growing, I have plants that bloom and seed the first year. Besides the looks of this grass, the pleasant aroma with many plants will fill your yard. Don’t cut or burn the plants down until spring as birds and small animals will eat the seeds all winter long. That’s what providing “native habitat” is all about, taking care of the critters that depend on it. Enjoy!!! Great Article! Did not know that it is a native plant to Wisconsin. I’ve been intrigued by this plant for a long time and haven’t yet incorporated into my perennial garden. After reading about its versatility and how to use as an accent plant I’m convinced this will be a welcome addition next spring. There’s so many great features! I also like the fact it’s a shorter species of grass that fits well into my garden , and it’s low maintenance and pest (deer) resistant. Glad to find something that will actually do well in clay soil and the deer don’t like it! It’s interesting to confirm what this plant’s preferred habitat is. I haven’t had as much luck with it on hillsides as opposed to flatter situations. Good to be reminded of the kind of plants it set off in the landscape. Interesting that it’s seeds derive from a fruit-like structure and are not actually a grain. I had known of people growing Prairie Dropped in southern Wisconsin, but didn’t know it was Hardy in Northern Wisconsin where I live now. I had wondered if it would try to take over the garden by self seeding, but I read that is not the case. I’m especially excited to learn that it is not favored by deer and can tolerate juglone! Just what I am looking for with black walnut trees in my landscape and herds of deer roaming through! I used to shop at Northwind Perennials. They have great selection of plants. I live in San Diego in a dry climate zone 9. Can I grow this grass? I love grasses. Everyone always talks about snow but what about hot and dry. I need this in my new yard! to ID the native ones in our NE area. We have a few in our gardens and plan to add more. I really enjoy ornamental grasses in my gardens. Prairie Drop seed will make a good addition to fill in where older plantings have lost their interest or withered, mixing well with broader leafed plants like coneflower, rudbeckia and the like. I also like the idea of fragrance and that birds like the seeds. I am looking forward to having this mix with my favorite, Little Bluestem? Super article on Praire Drop Seed. I like the idea of the usefulness of contrast of different foliage in the garden. I witnessed this in a viewing garden at the Paine Art Center and Gardens in Oshkosh, Wi. Think I will plant some for contrast with my Kale and Artichokes. I enjoy the several clumps of prairie dropseed planted in a mixed bed in full sun outside my front window. Last year on a very cold windy winter day a rabbit and I “eyed” each other as it huddled up to the clump of grass for protection. I have been slowly incorporating grasses into my gardens. I have learned from some of my fellow master gardeners about the enjoyment of using this grass. And I am very interested in the fragrance that I did not know exists with this grass. I will now be considering this one for sure. 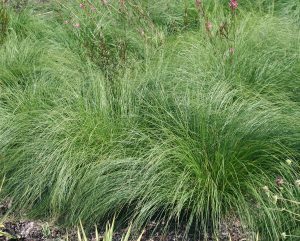 I am looking for some grasses to mix in with my other plantings, and I like that prairie dropseed is a mounding plant, is a native to Southern Wisconsin and birds enjoy it. Great article. Appreciate info on how growing this plant. Look forward to putting is a full sun rock wall area. I learned that Prairie Dropseed tolerates drought, but also periodic inundation so can be used on the upper edges of rain gardens. Otherwise it likes porous or gravel soils. Also I learned that it does not readily self-seed in gardens. This is interesting since it drops it seed or fruit-like achenes. From seed it is slow growing, taking about 4 years to reach blooming size. 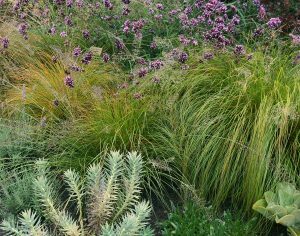 I have been interested in using grasses in plantings so was pleased to see ideas of using a single plant or mass planting along with companion plants. It was good to learn that it did not require dividing, and held a clump mass. Oh, great article!! We are using mostly natives as we restore our 72 acre farm and woodlands. There are several areas which we can use this shorter grass. We have a good mix of birds, butterfly, bees, and good insects. Plus have noticed an increase in turtles in our prairies. Our restoration of this old farm into prairies is a work of love and satisfaction…so we enjoy reading about native plantings! We also make good use of native plants within our Wood County Master Gardener public gardens we help maintain. Thanks again for excellent article! This looks like an attractive and useful plant for many places where I happen to garden. One of the features that appeals to me is that birds can eat the seeds. The article is a good reminder to plan to cut back dried plants as soon as the snow is gone. If I can find this at a garden store I think it would be a great addition to an area that I want to plant daffodils in. This might help hide the dying daffodil foliage and fill in once it completely dies down.